Hey Arrow Fans How are you? Good Morning or Afternoon to whoever reading this review. 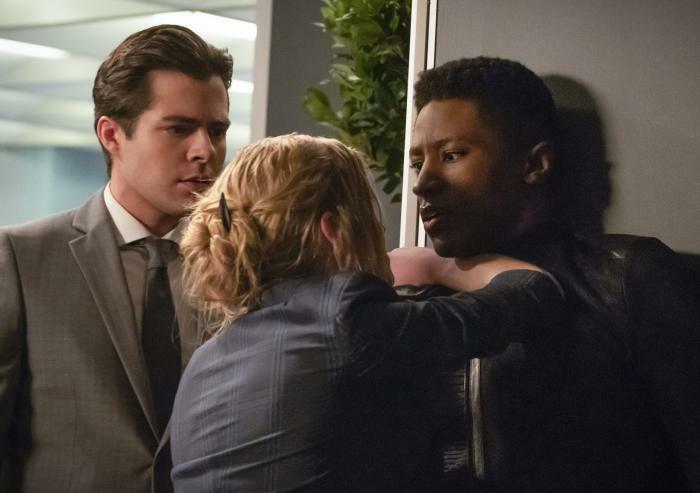 Well, I watched the episode even though I cannot stand the Flash-forwards, but the episode did not bring that much clarity, a little for some big questions that everyone started to ask after watching it. Before I get into the episode, I will go over a few moments of this episode. Mia Smoak. Okay, so we got to learn more about Mia and why she cannot stand to be a child of vigilantes. I find that pretty stupid that she hates vigilantes I mean come on so what if your mother lied to you. Star City is her home, and she will never stop fighting for it. We all know that Felicity wouldn't abandon Oliver’s mission because they both promised each other that they would carry on even if something happens to one of them. Mia’s character is okay, and yes she is like Oliver in many ways, but she has to understand that her parents always protect other’s people’s lives above their own that is the definition of being a hero. Felicity is alive. Yeah, I was not buying that Felicity is dead because we did not see a body. If there is nobody to prove that a character dies, then they are not dead. I was happy to see Felicity, and it was good to see her in the future that she does not change. I love that she can still babble and be her funny and lovable self in the future. The funny thing about it is the makeup artists tried to make her look old, but she does not look like she aged or she aged very well. Felicity is still blond and has no gray hair. The only difference is that they made Felicity walk slower to show the audience that she had gotten older. Anyway, I knew Felicity was not dead because she knows how to hide pretty well when she has a target on her back, and she carries a gun. The new Team Arrow in the future, So the whole saving the city thing was badass especially with Mia kicking the crap out of all of those guards and then firing an arrow to stop the bombs from going off. I think the new future team arrow dynamic is good for the flash forwards. I feel like that is the only thing I like because I get to see my boy, Roy. Let’s talk about Roy for a second is he doused on that super soldier stuff from season two. If you know the name could you leave it in the comments it is in my brain somewhere, but I cannot find the word? Anyway, Roy went crazy on that guy out of nowhere can I see more of that because that was cool. I am Happy Rene has come to his senses at the end of the episode because I was worried that he was denial about the whole situation. I really cannot wait to see how this whole new team dynamic plays out in the end. Mia and William. This part might be short, but I love Mia and William scenes; it gives them a chance to get to know each other more. It was great that they were able to clear the air about some things that their parents did. I love how they did understand why their parents did what they did to protect them. They both did not like being the children of vigilantes but what can you expect it is hard for them to understand why their parents did not choose family over other people’s lives. In all honesty, I do see that Mia perspective on vigilantes can change as she reconciles with Felicity as the show progresses. I want more scenes with Mia in William in upcoming episodes. Felicity pulled a Tony Stark. Okay, so I am going to make all of the Marvel references as more future episodes play out. I find it very funny that Felicity created archer was the worst decision that she regrets in the future. I mean she created an Ultron for the Arrowverse. I am terrified right now because we can blame felicity for building a simple IA system to make a better Star City. Do you guys remember last week’s episode where Diggle told Felicity that she would change the world? That went right to Felicity’s head literally to make a system that is being used for evil. Run the archery program is out to get and terminate all vigilantes. If you think about it is like X-Men with the sentinel's project. So let me know in the comments what you guys think about this episode? Now as for the questions unanswered in this episode where is Oliver, Thea, Diggle, and Laurel? What happened to Roy to make everyone think that he was dead? How is Star City a crappy City? Next week we deal with Emiko who is not a hero and has no right to wear the hood of the Green Arrow. I think that this whole half-sister story line does not make any sense whatsoever. I would give this episode an 8.5/10.